The All new Fairway 43 Sedan is designed to offer the very best in cruising boat comfort and economy. The Fairway ECO Cruise hull shape provides serious offshore cruising ability, remarkably economical cruising and outstanding accommodation for up to 6 in luxurious surroundings. 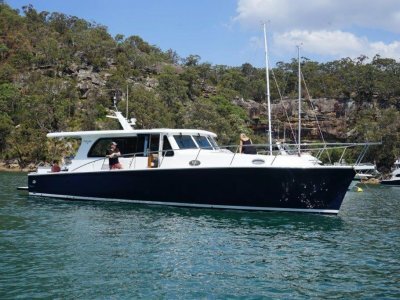 The galley is equipped with electric hotplates and Fridge Freezer as well as microwave oven and has plenty of storage for provisions if coastal cruising. To port in the saloon is a large L shape settee with dining table. The rear cabin doors open up right across the boat so that the saloon flows out to the cockpit offering a huge living and lounging area. The cockpit has built in seating across the stern and removable table for entertaining or dining outside. The Hardtop almost completely covers the cockpit and has side covers so that it can be used in all weather. Access to the bow is now safer and easier as we have added walk around side decks through to the bow. A centre rear cockpit door opens out to an extended swim platform and there is a storage boot which accessed from the Platform for BBQ, Outboard engine, Fenders Fishing Gear etc. The platform has a Stainless Steel rear rail for tender and cockpit mount. 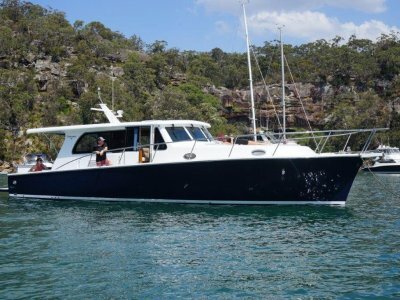 The New Fairway 43 Sedan is built to coastal cruise and the Fairway hull has an excellent reputation for ability at sea and outstanding economy. 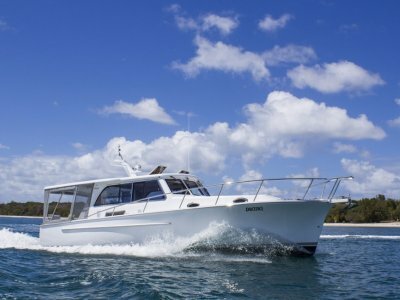 The Fairway ECO Cruise hull offers around 18 Knots with standard 380 HP engine and will cruise at up to 15 Knots. At displacement speeds of 8-9 Knots the boat will average around. 1.2-1.5 Ltr per nautical mile which gives a remarkable range of between 550 and 700 Nautical Miles. Even at 12 to 14 Knots fuel usage is only around 30 to 35 Ltr per hour which will give a range of between 340 and 400 Nm. Side door at the helm for easy handling of lines and anchoring. Extended swim platform with SS rear rail so that fishing and outdoor cooking is catered for. 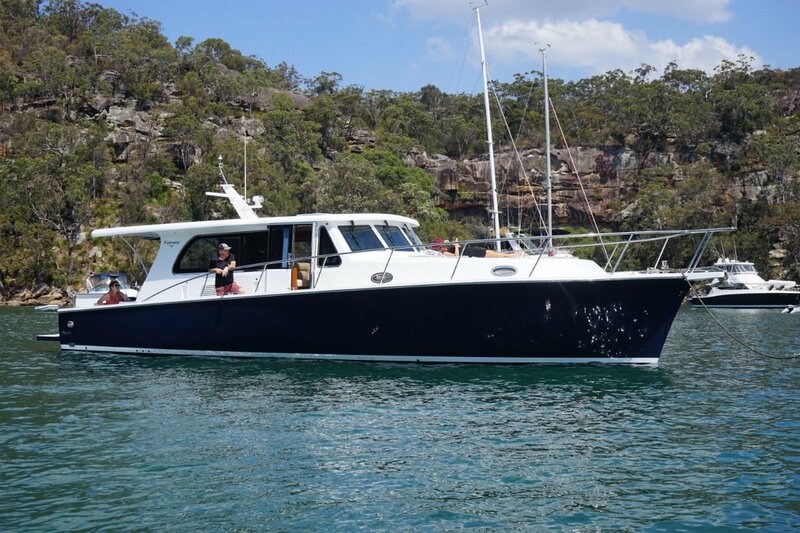 Twin Air-conditioning systems for a cool nights sleep or when cruising the reef. Bow and Stern Thrusters are fitted as standard for easy maneuvering in tight spots.